It’s easy to get so excited about the brand new freebie you’ve created to bribe your visitors to subscribe to your email list that you forget a key element or two. 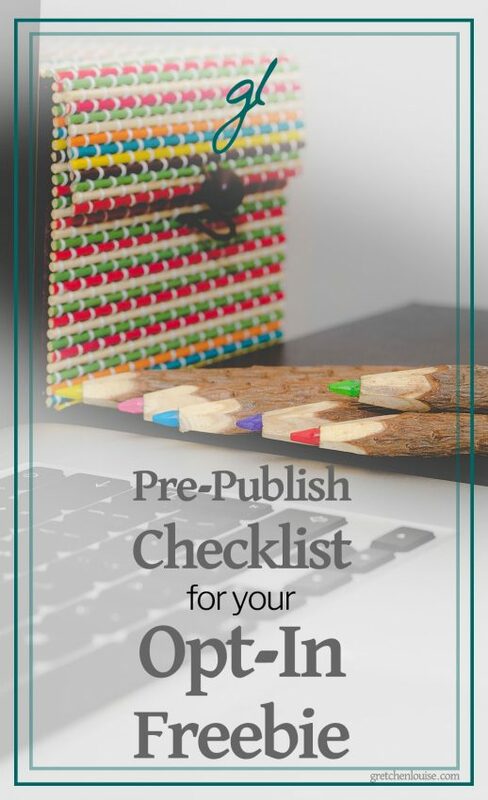 Here’s a quick pre-publish checklist to make sure your file is ready to share with your subscribers. It’s so obvious it is easy to miss: make sure your name is clearly visible on any and every page of your printable. Indicate the copyright on at least one page, perhaps even the footer of every page, right along with your name and website address. If you’re offering an excerpt of a book, include information about where the rest of the book can be purchased (link to a page on your website that includes an affiliate link, rather than using an affiliate link here–this saves you from having to disclose and/or going against affiliate terms of service). If you’re offering a checklist about a topic you’ve written more about, include a link to read more. If you’re offering a content upgrade, be sure to link to the original post featuring the topic. Be sure to specify that this resource is for your email subscribers only–not to be directly shared or forwarded in any way. Then include a link for your email list signup page (or the home of a speficic content upgrade) where your subscribers can direct their friends to get their own. Feature your logo, use fonts and color schemes that coordinate with or match your website. Keep paper and ink in mind when you design your freebie. Don’t have excessive margins or use unnecessary pages if possible. If you design it in color, make sure it also looks good when printed in black and white and is legible on a low quality print setting. Save your printable as a PDF so that the formatting appears the same no matter the device. Make sure your file is an appropriate file size and downloads almost immediately no matter the internet speed. Use a free PDF compression tool if necessary. Consider zipping media files if necessary to reduce download size. Giving Away a Media or eBook File? If you are giving away a song, video, or eBook, you’ll want the email containing the download link to include points 1-5 above. Be sure to include your name and website address in the file name. Create a custom file specifically for sharing through your opt-in, including the information that it is a gift for your subscribers only and not for distribution. Wrote you earlier this morning about troubles figuring out how to upload a “link” to my free prequel. My techie daughter helped me see the big picture, and of course, it was as simple as I expected it to be! Sigh…. I zipped my files and uploaded it to my website and – ta da! – a url I can use! She also explained I could have done the same thing and shared via Dropbox or GoogleDrive, etc. I think people who explain complicated techie things need to remember to explain the simple stuff, too! (Not just you – I went to dozens of sites to figure out this dilemma, and everyone said “upload your link” rather than “you must host your files on your website or on Dropbox or here or here, and that is how you will get a usable link to share.”) I am amazed that this piece of info was not in my brain, considering everything else I have learned and done on my own this past year, but somehow it wasn’t! 🙂 I do like your site a lot though and will learn much from you, I’m sure. Thanks! This is really great information Gretchen! I am so grateful I found you! Thank you! I finished my freebie but missed a couple things on your list. Thank you!! I’ve noticed that you mention having your file as a PDF. Mine is currently a word document so how would I change it to a PDF? I’m aware of the fact that to make a PDF with Acrobat it costs money and I have to upgrade to another plan. Is there any other way I can do this for free? Most current versions of Microsoft Word give you a “Save As” option for PDF–for free! Reworking my freebies is now on my to-do list, inspired by this–but not in an overwhelming way. I <3 your tutorials, Gretchen. Thank you.